Shell V-Power Racing has gone one-two for a second straight session although Scott McLaughlin turned the tables on Fabian Coulthard in Practice 3 at the WD-40 Phillip Island SuperSprint. McLaughlin set a 1:30.1861s during his first run which stood up for the remainder of the half-hour session, as Coulthard came up 0.0443s short on his final flyer. James Courtney put the #22 Mobil 1 Mega ZB Commodore third at 0.2316s away from the fastest lap, ahead of Cameron Waters (#6 Monster Energy Mustang) and Jamie Whincup (#88 Red Bull HRT ZB Commodore). The latter’s Triple Eight team-mate Shane van Gisbergen, however, was back in 13th in the #97 ZB Commodore with just eight laps to his name after a lengthy rear suspension geometry change. Whincup laid down a 1:30.5028s, 0.4412s faster than he had gone the day prior, on the very first timed lap of the hit-out, although he found no improvement thereafter and ended up 0.3167s off the top. 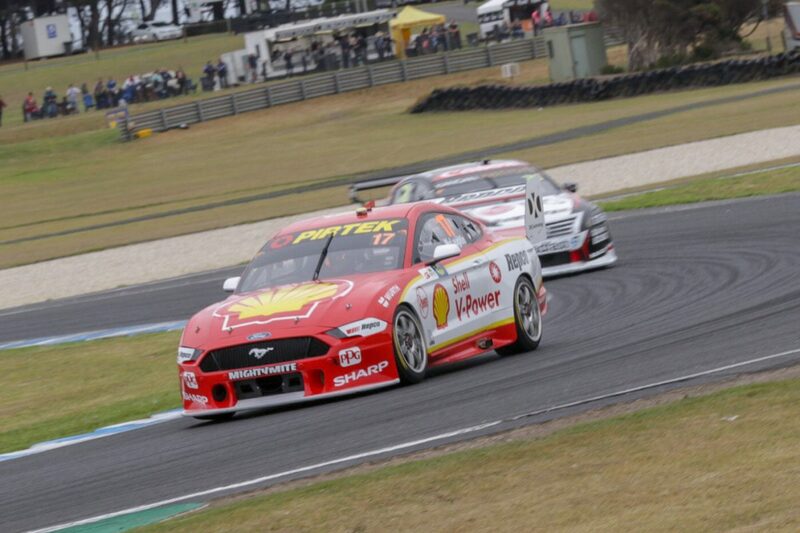 McLaughlin was second to the seven-time champion after the respective first flying laps before moving the #17 Mustang to the top next time around despite running on reportedly well-used practice tyres. He reverted to the tyres which were new when he ran them in Practice 1 but was held up at Doohan Corner at the start of his final run by James Golding (#34 Boost Mobile ZB Commodore), who was on an out lap, with race control advising that the matter will be investigated. Coulthard then elevated himself from fifth to second in the #12 Mustang before Waters and then Courtney went to third. The latter set the fastest first sector next time around but couldn’t move his personal best across a whole lap with the chequered flag out. “That was a bit of a balls up; it’s not the nicest thing coming down the front straight and cars weaving going into the fastest corner in Australia,” said McLaughlin of his run-in with Golding, who was one of several cars sent on-track as those at the head of pit lane charged back around. “It was pretty wild. I actually thought he saw me there so I was going to keep going, but then he came across I was like ‘ah crap’. The New Zealander was pleased to almost replicate his early hot lap near the end of the session. “I was stoked to do that second lap, like a 30.2 even on that tyre. Early in that session we did a 30.1. Golding recounted, “I was just warming my tyres up coming put of the pits and obviously I didn’t see Scotty coming up behind me. Chaz Mostert sat third at a red flag which came at the end of the second runs, with around 12 minutes remaining, when the geese continued their unbroken run of interrupting each session so far this weekend. The #55 Supercheap Auto Mustang ended up sixth, from Todd Hazelwood (#35 Matt Stone Racing ZB Commodore), Lee Holdsworth (#5 The Bottle-O Mustang), Andre Heimgartner (#7 Plus Fitness Altima), and Scott Pye (#200 Walkinshaw Andretti United ZB Commodore). David Reynolds had an early sensor problem before setting a time good enough for 11th in the #9 Penrite ZB Commodore, ahead of Rick Kelly (#15 Castrol Altima) and van Gisbergen, who was 0.9607s off the pace. Mark Winterbottom was 1.0641s slower than McLaughlin as he took up 14th in the Irwin Racing ZB Commodore, ahead of De Pasquale (#99 Erebus ZB Commodore) and rookie Garry Jacobson (#3 Rabble.Club Altima). Will Davison (#23 Milwaukee Racing) ended up 20th, 12 positions back from the fifth of the six Mustangs. The next session is Armor All Qualifying for Race 9 from 1315 local time/AEST.